It’s mid-June, folks, and today is Friday. You know what that means. 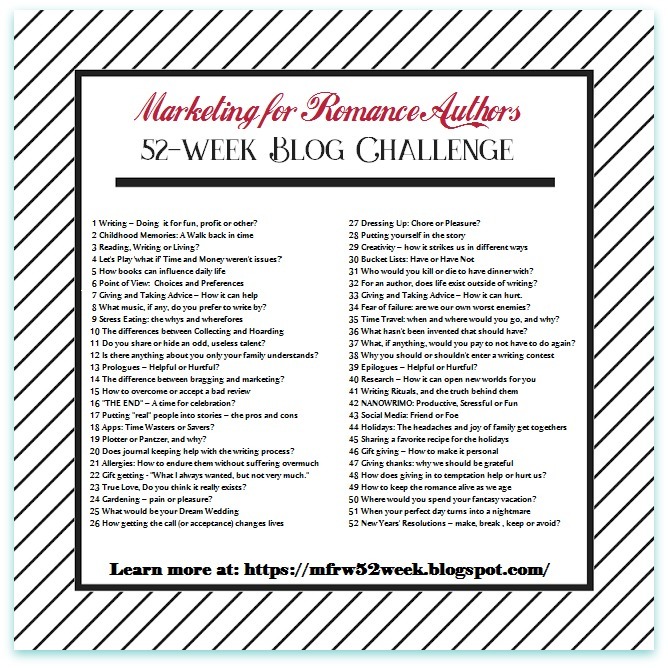 It’s time for another topic in the Marketing for Romance Writers 52-Week Blog Challenge Blog Hop. I said early on I wouldn’t participate in each topic this year and missed the last couple weeks. This is an easy topic if I think of it as a material thing I can’t live without. This, of course, would be my laptop and tablets, pens and notebooks—the paper kind, books, glasses, and a phone. I look at these tools as one group so I’m not really cheating on the topic and listing more than one. Did you buy that? I use a laptop to make a living by researching, writing, publishing, marketing, staying in contact with readers, and so much more. These tools are also a part of my social life. A phone and laptop are used to socialize electronically with friends and family who are far away, or even those who are close, to confirm an event or gathering like breakfast or lunch…you get it. I’ve had to live without these tools I stated above during a power outage or a weather-related incident like a lightning storm or worse. Last night my area lost power for over three hours, so yeah, it’s hard to unwind and not have these tools available at will. My phone did work, though, but it drove me nuts for the first hour not to have use of my items. Then I turned on my Kindle to read a recent book I bought for research. I’m enjoying the story based on the real life of a famous ranching and bronc riding family. If the battery ran low, I could continue reading on my iPad, knowing I’d have to go out to charge my items tomorrow if power wasn’t restored. The laptop battery would be conserved for an Emergency-Writing-Fix. LOL. If we’ve never had these items to work with on a daily basis, how could we miss them? That statement reminds me of writing my first two long books on legal pads before I owned a computer, or the time I started a new book on paper during another long power outage. I wrote about another power outage here. Wow, this was written in 2009! How things have changed. Others may look at this topic as mentioning the basic needs we depend on as humans and maybe this would seem a better fit for this week, but I have a feeling it means a material thing since it says “item” we can’t live without. This week’s entries should be interesting, and I can’t wait to read them. On the home front, we’re headed for a heatwave this weekend. I sure hope the power stays on. After last night, I’m hoping it wasn’t because of overload with everyone blasting their/my Air Conditioning. With the history of my heat and AC unit, I’m happy for each minute that it works. We’re doing a Blog Hop, friends. You’ll find other participating authors HERE. I’m glad you all stopped by today. I forgot to mention laptop as a necessary need plus paper and pens. My list is growing. Thanks for sharing. We’re having a heatwave here, too! And, I used to LOVE writing on legal pads! Tons of them in a huge plastic container inside my closet 😀 Miss those days, actually. Thanks for sharing! A computer also tops my list, which gets comments from families because when i used to program them many years ago I swore I’d never have one in my house. In the aftermath of Superstorm Sandy we didn’t have power for over a week. Talk about going back in time. we pulled books off the shelves and read by the light of an oil lamp. I’ve used oil lamps after losing power at my cottage before, and I’ve written under candlelight. It opened my eyes to appreciate what I have with a plug on it. I find it hard to read a print book these days, so doing it in dim light for me, would be out. I’d have to get a magnifying glass! A week is a long time to go without power, Helen. 😦 My longest has been five days, which was too long. A computer seems to be in the top three choices. I thought as much, Holly. We have to do our job no matter what the circumstance. I’m glad you stopped by. A computer would top my list, too. Paper and pens, not so much. Glasses . . . probably. I would use paper and pens in an emergency, Ed. I’ve lost power for nearly a week before, but I did go to the nearest Starbucks for serious charging of laptop and tablets. 🙂 Thanks for visiting! Keep cool, cucumber. TGIF hugs. I can understand the “cool pads,” Teagan. Concerning noise, I have a ceiling fan in my bedroom, and it has a swooping sound on each turn. Some nights I can ignore that sound and on other nights, I have to turn it off. Traffic noise where I live is almost like white noise, but there are times it drives me crazy. Those nights usually turn into my Pandora nights to drown it out. I get your noisy thing, but living in this place, I’ve learned to half-way accept and be patient. Moving as soon as I can.